1. How many steps will be required to complete the given input? From Input to Step I. The word that comes first in alphabetical order goes to the first position. The smallest number goes to the second position. The rest of the line shifts rightward. From Step I to Step II. The word that comes second in alphabetical order goes to the first position. The second smallest number goes to the second position. The rest of the line shifts rightward. This goes on until in the last step all the words are arranged in reverse alphabetical order and the numbers are arranged in descending order from left to right. 2. Which of the following is the third element from the left end of step VI? 3. Which of the following is step III of the given input? 4. What is the position of ‘nice’ from the left end in the final step? 5. Which element is third to the right of ‘family’ in Step V? Direction (6-10). The given questions are followed by two statements I and II. You have to decide which of the following statements are required to answer the question? Six persons -A, B, C, D, E, and F are sitting around a circular table. All are facing towards centre. Who among the following is sitting to the immediate right of F? Statement I: D sits second to the right of A. Two persons sit between B and D. C sits second to the left of F.
Statement II: E sits second to the left of A. Two persons sit between C and E. F sits second to the left of B.
E sits to the immediate right of F.
Five persons A, B, C, D and E are living in a five floored building with top floor numbered as 5. They are also are of five different ages. Who among the following is living on bottom floor? Statement I: A lives on an even number floor. Eldest among them lives on Odd number floor. One person lives between A and C. Person who lives on floor number 4 is youngest of them. E is elder than B but younger than D. A is elder than B but younger than D. B lives on top floor. Statement II: E is elder than C but younger than A. D lives on odd number floor. Only one person lives between D and B. A lives below D but above E. Eldest of them lives on floor number 3. B is elder than C but younger than D.
E lives on bottom floor. A, B, C, D, E, F and G sit in a row having seven seats. All of them are facing north. Does D sit at one of the extreme end of the line? Statement I: B sits third to the left of G. Two persons sit between C and E.
Six persons – A, B, C, D, E and F are having different weights. Who among them is the lightest? A, B, C, D, E, and F are six members of a family. How many females are there in the family? 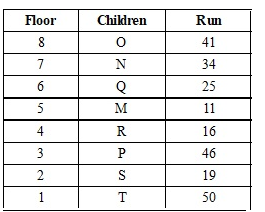 Eight children M, N, O, P, Q, R, S and T live on eight different floors of a building but not necessarily in the same order. One day they played a cricket match and scored different runs viz— 11, 16, 19, 25, 34, 41, 46 and 50 but not necessarily in the same order. The ground floor of the building is numbered one, the above it is numbered two and the topmost floor of the building is numbered eight. The total runs which were scored by P and T is a multiple of 4. The difference between runs which was scored by Q and S is 6. The one who lives on 6th floor scored 25 runs. Only one child lives between R and the one who scored 25 runs. S lives below R on an even numbered floor. S does not score 25 runs. The one who scores 46 runs lives immediately above S. Only two children live between R and T. T lives below R. Only two children live between M and the one who scored 41 runs. M lives above S. The one who scored 41 runs lives above M. N scored 34 runs. The one who scored 11 runs lives immediately above the one who scored 16 runs. Only one child lives between O and Q. Four of the following five are alike in a certain way and so form a group. Which one does not belong to that group? 12. Who scored 11 runs? The one who lives on the floor numbered-2. The one who lives on the floor numbered-6. The one who lives on the floor numbered-4. The one who lives on the floor numbered-3. 13. Which of the following statements is/are not true? The one who scored 16 runs lives immediately above P.
P did not score 46 runs. S lives on third floor. 14. How many children live between M and the one who scored 46 runs? 15. Which of the following combinations is/are true? Q – 25 – Floor numbered-6. R – 16 – Floor numbered-2. P – 19 – Floor numbered-3. Ten friends M, N, O, P, Q, R, S, T, U and V took IBPS Clerk Preliminary Exam which was scheduled from Monday to Sunday of the same week. In between there was one holiday on which exam was not scheduled. After the result each got different marks viz— 45, 49, 51, 53, 56, 57, 62, 63, 68 and 75. On each day (other than holiday) at least 1 friend had exam and at most 2 friends had exam. M got 45 marks. M’s exam was scheduled on either Thursday or Friday. There was one day between M and P’s exam. P’s exam was after M’s. There was one day between P’s exam and the one who got 63 marks. The one who got 75 marks had exam on Saturday. N got 12 marks more than the one who had exam on the same day as N. Only one friend had exam on Tuesday. V’s exam was just before the one who got 49 marks. V’s exam was not on Saturday. There were two days between the exam of M and U also there were three days between the exam of N and V. U had exam alone. 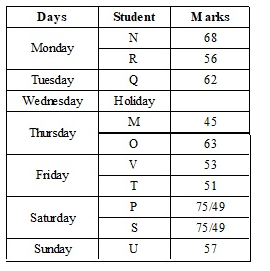 O’s exam was scheduled just after the day on which there was a holiday. There was one day between the exam of O and the one who got 49 marks. O’s exam was before the one who got 49 marks. The one who had exam on Sunday got marks which is multiple of three. There is difference of five marks between the one of the friends who had exam on Sunday and the one who had exam on Tuesday. T got 51 marks. T and O’s exam was not on the same day. Q’s exam was scheduled just after R’s. 16. Which of the following statements is/are true? O’s exam was scheduled after Thursday. P and S’s exam was scheduled on the same day. 18. Who got the highest marks? 19. On which of the following days was the holiday? 20. How many marks did U get? Which element is third to the right of ‘family’ in Step V? 6. Six persons -A, B, C, D, E, and F are sitting around a circular table. All are facing towards centre. Who among the following is sitting to the immediate right of F? 7. Five persons A, B, C, D and E are living in a five floored building with top floor numbered as 5. They are also are of five different ages. Who among the following is living on bottom floor? 8. A, B, C, D, E, F and G sit in a row having seven seats. All of them are facing north. Does D sit at one of the extreme end of the line? 9. Six persons – A, B, C, D, E and F are having different weights. Who among them is the lightest? 10. A, B, C, D, E, and F are six members of a family. How many females are there in the family? Which of the following statements is/are not true? How many children live between M and the one who scored 46 runs? Which of the following combinations is/are true? Who got the highest marks? On which of the following days was the holiday? How many marks did U get?